Strip malls probably don't fit into the definition of progressive urbanism for most people, but maybe they should. Well, maybe after a little organizational tweaking. The small retail centers are ubiquitous in American cities, with their generic shops selling donuts or beer, offering dry cleaning or key-cutting. They're a part of many neighborhoods, but not necessarily an essential part. They bring goods and services to the area, but are ultimately of the greatest benefit to their owners – off somewhere cashing monthly rent checks from the moms and pops running the little businesses within. That model can change, according to Ava Bromberg. She's a PhD student in UCLA's School of Public Affairs who is developing a new vision for small retail centers that would transform them into engines of social and economic capital at the neighborhood level. "It's part mall, part business incubator, part cultural hub," says Bromberg. The idea is to overlay a distributed ownership model on the typical strip mall that enables the value created by this commercial real estate to cycle back and benefit the neighborhood it serves. Consumers are also business owners, property shareholders, and decisionmakers. 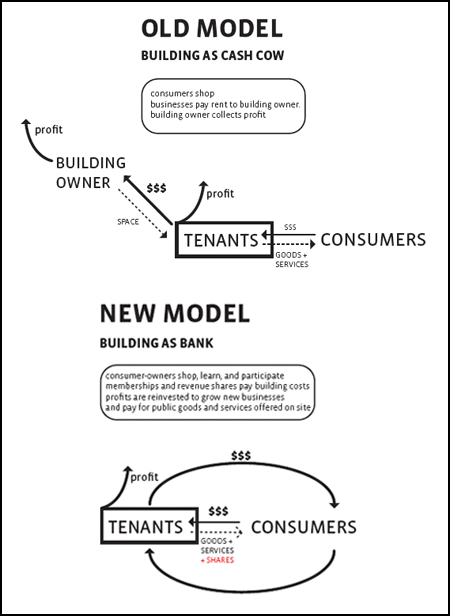 In this model, the building goes from being a cash cow for one owner to being a bank for the community, into which investments can be made and from which public benefits can be funded. But it's also about activating disused retail space for more than retail. Bromberg wants the spaces to partner with local institutions like hospitals and universities to create learning environments and job training opportunities on-site. The idea is to retool the existing neighborhood infrastructure to serve unmet needs within the community. "I'm hoping to hybridize something like the land trust with the co-op and the condominium to create a really viable, flexible but durable institutional structure that allows the value that's generated by users of the space to be able to be reinvested in that space and its programming," says Bromberg. She has been working with architect Paul Schuette to develop the idea. This "social entrepreneurial model for commercial real estate" is the basis of Bromberg's PhD research at UCLA. Through cooperatively-owned businesses, community members can both teach and learn business techniques, and use that knowledge to continue the growth of the local economy. "One of the key issues that continues to plague inner city neighborhoods is a lack of access to capital to do things," says Bromberg. Those things include building new parks and providing public services that are often lacking in lower income neighborhoods -- from fresh grocery stores to financial services. Bromberg says the programming could be tailored to each neighborhood's demographic, based on a template of clustered basic services. Architect Roger Sherman, who is also a professor at UCLA, recently reviewed the project concept. He says the strength of the idea is that it meets a distinct and widespread community need, especially amid an economic recession. "It's very clear to me that the rules have changed and that it's very possible for somebody who has a really good idea to create an audience that can sustain that idea if it's really well branded and really cunningly conceived," says Sherman. "But developers, for the most part, are not those types of people. They're in a different silo." Sherman says Bromberg's idea is a new concept in the realm of commercial real estate, but there are a few examples of existing projects that shift ownership of commercial real estate projects to community members. One of them is Market Creek Plaza in San Diego. It's a community-owned retail center that is both a venue for local businesses and a cultural hub. The plaza creates a venue for locals to try out their business projects, and the development's collaborative governance structure gives them a voice in the operation and future of the project. A portion of the profits are directed back into a neighborhood-controlled community foundation used to continue economic development within the community. While the goals are heady, the costs of business are still a factor. Market Creek Plaza was made possible by a $23.5 million contribution from the Jacobs Family Foundation. Bromberg doesn't yet have capital support for this idea, but she's working on getting some seed funding to begin laying out the business plan and organizational structure. Bromberg has been is discussions Newell Lessell of the ICA Group in Boston, which consults and structures worker- and community-owned co-ops and businesses. But beyond the seed funding, Sherman says finding the capital within neighborhoods to continue this process may require some creative outreach to institutional partners or foundations. "Even though she's kind of ahead of the curve on this, I just don't know whether or not the funding mechanisms are going to be equally ahead of the curve initially," Sherman says. He says the path to true community ownership may end up taking its first steps with one or two starter owners who then transfer ownership to the community over time. No exact physical location for the first iteration of this project has been selected, but a disused Los Angeles strip mall is seen as the perfect canvas for a pilot run. In the meantime, Bromberg will continue building her team. She hopes to develop the model and policy framework that can transplant this idea to any place with underused retail space and a community seeking more control over their local economy. She hopes such an engine will be able to turn the economic soil of a neighborhood, and develop learning, work, and social opportunities that local residents desire. 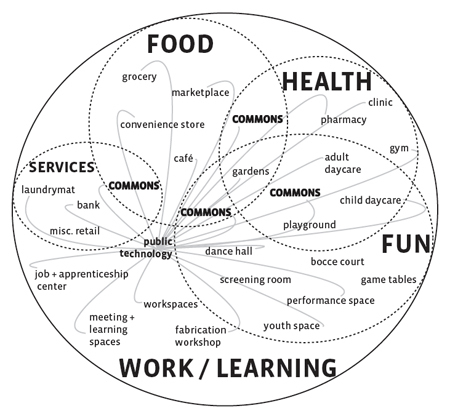 Bromberg and Schuette have developed a speculative version of the model, which they've titled CoOperating System: Consumer Cooperative Commercial, Cultural, and Civic Center and are using to approach seed funders to formally engage ICA Group to develop the intricacies of the ownership model. "Obviously there's a lot of complications to be worked out," Bromberg says. As she continues her research, she recognizes the need to nail down the legal and institutional structure that will enable this sort of community-owned commercial enterprise. As those details develop and seed funding is sought, it's likely that the demand for such community-owned concepts will continue to increase -- in L.A. and beyond. Nate Berg is assistant editor of Planetizen.